Are you looking into having your own or company iPhone application to showcase your products, notify your customers with upcoming promotions and allows your users to get in touch with your business easily? Increase you marketing efficiency with iBlitz. 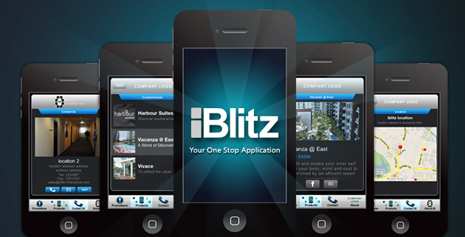 iBlitz is a native iPhone application designed to provide business with a quick and easy platform to enter into the Mobile platform without the need of programming knowledge. It provides the bridge to allows the users to connect and keep updated with your products and promotions. We have fixed the bug for brush sizes issue, and submitted new version 1.1 to apple store, please kindly update your app once it is available in the iTune store within the next few days. We apologize for the bug and inconvenience. Tataro Drawing Pad Live in iTune !! After a year break, a new app addition to the Tataro series. Tataro drawing pad is an app that allows you to bring your imagination in your iPad. Take a photo, add your doodles, add texts then save to your library or share with your friends on the social media. Tataro Magic Match Live in iTune !! The next addition to our Tataro series is out on iTune! Introducing, Tataro Magic Match, a matching game where you have to match the magic symbol as fast as you can to beat your friends to the high score ! Facebook Highscore, compete with your friends !! FreshIssue launch iPhone app with iBlitz !! We are excited to announce that FreshIssue have launch their own iPhone app live with iBlitz in the app store. Tataro Plus Christmas Update have been released on iTune store !! New Christmas room specially for this christmas !! WatchWat is your source of information you need to stay updated on the latest upcoming movies and the movies in cinemas with great looking user interface for improved user experience. Find movie synopsis, trailers, and movie information and share them through facebook or email. Find your nearest cinema with the aid of a map. Blitz Interactive introduce new product - iBlitz! Tataro Lite version update 2.0 have been released on iTune store !! Tataro Plus version have been released on iTune store !! Blitz Interactive LLP was founded and established in 2011 by two like minded individuals Alvin and Shian. In Blitz Interactive, our mission is to create and develop applications using advance and innovative technology that aims and focus on improving and maintaining a positive lifestyle of our people.